The Lord is taking me to places I never would have imagined. How about a Dog Training Show? For some reason and I do not question where Christ leads me, He wants me to be heard on this show! You can go to this site if you want to listen or call in to ask questions. Go to: http://www.blogtalkradio.com/k9pack You can call the following number to listen to the show (714-464_4892) . I will be on this show twice. The first show was yesterday and it has been archived so you can still listen to the show. The second show will begin on March 1, 2013. The time the show will start will be 2:00 pm Eastern Standard Time or 11:00 am Pacific S. Time. Quote from expert on rays: "Bob Rubin, of Santa Rosa Junior College in California, is one of the world's leading expert on Rays, and spoke to MailOnline about the find in Gaza. He said: ‘Mobulas often travel in huge schools of thousands of animals and also leap from the water and twist in the air. Very cool indeed. 'This observation is strange to me and unknown to me as well. I have worked in the Gulf of California for many years where there are abundant mobula schools and I have never seen a "mass stranding". Prophecy Sign: Matthew 24:7 7For nation shall rise against nation, and kingdom against kingdom: and there shall be famines, and pestilences, and earthquakes, in divers places. Luke 21:11 And great earthquakes shall be in divers places, and famines, and pestilences; and fearful sights and great signs shall there be from heaven. Jesus warned us to watch for diseases. Are we in the birth pains of this sign as Christ warned? Take a look at how the shot list below has gone up since 1940 and you will get a eyes view of the birth pains in a differnt way! shall all families of the earth be blessed” (Genesis 12:3). earth be gathered together against it” (Zechariah 12:3). Europhobe got one fourth of the popular votes. He is the idol of Italy's youth. "Jew" has become an accepted insult once again in Europe's public square.Mr. I have more videos and more news for today Feb. 28th at my new site. Please go to www.endtimesresearchministry.com to see the rest of the news. 10:30 am Wed. Feb. 27, 2013 Eastern Standard Time or 7:30 am Pacific S. Time. be 2:00 pm Eastern Standard Time or 11:00 am Pacific S. Time. I will be speaking in Atlanta Ga on April 20, 2013. The address of the Hotel is: Hyatt Regency Atlanta (downtown), 265 Peachtree St., NE, Atlanta, GA 30303. I will probably be speaking in the HANOVER ROOM however, UNLESS THINGS CHANGE, WE WILL BE IN THE ---“HANOVER ROOM.” ALL THAT INFORMATION WILL BE AT THE CONCIERGE DESK WIHEN you come in. More information will be posted during the week of my presentation. Looking forward to meeting the many faces who come to my web site. Download my book for free. Go to www.endtimesresearchministry.com. Go to: http://www.blogtalkradio.com/k9pack You can call the following number to listen to the show (714-464_4892- . I will be on this show twice. The first show ran today at 7:30 am Pacific S. Time. The second show will begin on Friday March 1, 2013. The time the show will start will be 2PM Easter Standard Time or 11AM Pacific S. Time. Prophecy Sign: (Disease) Matthew 24:7 7For nation shall rise against nation, and kingdom against kingdom: and there shall be famines, and pestilences, and earthquakes, in divers places. Watch the news today I am sure you will hear more about this outbreak. Go to: http://www.blogtalkradio.com/k9pack You can call the following number to listen to the show (714-464_4892- . I will be on this show twice. The first show will start at 10:30 am Wed. Feb. 27, 2013 Eastern Standard Time or 7:30 am Pacific S. Time. The second show will begin on March 1, 2013. The time the show will start will be 2PM Easter Standard Time or 11AM Pacific S. Time. Yesterday I posted some informaiton about the Pope. As you know the current Pope resigned. Do you want to see why he resigned? If so watch the video below. Before you watch the video let it be known that Pope Benedict is (Joseph Ratzinger) a defendant in this case. Prophecy Up-date with Frank DiMora/Bringing you up to speed/Antichrist sign or not? I have been away in Costa Rica where the Lord has allowed me to witness to many people. During my time away from posting much has happened. I want to bring you up to speed with the prophecy concerning the deaths of fish, birds, and animals. Below is a list of reports that I have encluded in my latest book dated Feb. 22, 2013. February 8, 2013 - 200+ Ducks found dead on 2 ponds in Nowra, Australia. February 10, 2013 - 100 Turtles wash ashore dead in Andhra Pradesh, India. February 11, 2013 - Hundreds of Birds dead from Bird Flu in Jhapa, Nepal. February 14, 2013 - Fish kill in Lake Ginninderra in Canberra, Australia. February 15, 2013 - Thousands of Fish found dead in Angrignon Park, Canada. February 19, 2013 - 720,000 Chickens to be killed due to Bird Flu in Mexico. I also wanted to bring you up to speed with the number of huge earthquakes that have hit during the month of February so far. Get ready because more are coming! A magnitude 6.8 earthquake struck North-central Chile, February 1, 2013. A magnitude 6.0 earthquake struck the SolomonIslands, February 1, 2013. Also on Feb.1, 2013 a 6.2 quake struck the Solomon Islands. A magnitude 6.7 earthquake struck the Santa Cruz Islands on February 1, 2013. A magnitude 6.0 earthquake struck the Santa Cruz Islands again on February 1, 2013. A magnitude 6.0 earthquake struck the Santa Cruz Islands on February 2, 2013. A magnitude 6.2 earthquake struck Mindanao, Philippine Islands February 16, 2013. The U.S. Geological Survey says the magnitude-5.7 quake that struck Saturday evening was centered 202 kilometers (126 miles) east of East Timor’s capital, Dili, at a depth of 35 kilometers (22 miles). 4.3 earthquake jolts parts of San Diego A 4.3 magnitude earthquake off the coast of Baja California, gave San Diegans quite a jolt Friday night. According to the US Geological Survey, the quake happened at 8:40pm. Back in 2008 I wrote a post entitled: Steps to one world government-Berlusconi and global economy!-More Noah signs, gay marriages in Conn.--Bird flu-America decline-Famines- Oct. 10, 2008. I wrote that post because I have been watching Silvio Berlusconi. Why? Because as long as he is doing things that run parallel with scripture I think it important to watch what he does. Below is what I wrote. Prophecy Sign: Antichrist signs: Jesus gave us signs of what the Antichrist would be like. He told us what to look for. In 2nd Thessalonians 2:4 it states, "He opposes and exalts himself over everything that is called God or is worshiped, and even sets himself up in God's temple, proclaiming himself to be God." We know from Revelation chapter 17 that the false church will sit on the beast (Antichrist) in Rome. This means that the Antichrist will come from Rome which is in Italy. Daniel saw all the kingdoms from his time all the way to the last kingdom which he says will be the reborn Roman Empire. The European Union is that reborn Roman Empire and Italy has been a major player in the EU since it started. One of the major signs of the end times is the rebirth of the Roman Empire, so watching the signs concerning the political climate within the EU should be taken with special interest. The is one man you should pay special attention to, and that is Silvio Berlusconi. Berlusconi is the former Prime Minister of Italy. He is one of the most powerful men in all of Europe and he is one of the richest men in the world. In a few day Italy will elect a new Prime minister. As it stands right now, officials are saying Berlusconi will win. Why is this so important? This same man Jesus spoke about will in the end times take control of the world economy. Remember Jesus said when this man comes he would exalt himself? Let me give you some quotes Berlusconi has stated about himself. You can click to the links below and read them for yourselves later. Here they are. 1. "I am the Jesus Christ of Politics. I am a patient victim, I put up with everyone, I sacrifice myself for everyone" . 2. There is no-one on the world stage who can compete with me." 3. In the Guardian report Jan. 18, 2004 they reported that Berlusconi calls himself 'monarchist' which means (he being the king). Now let me ask you a question, does this sound just like Jesus warned us about the personality of the Antichrist? Now look at what Berlusconi said about the economy and how to control the economic crisis. “Oct. 10 (Bloomberg) -- Italian Prime Minister Silvio Berlusconi said political leaders are discussing the idea of closing the world's financial markets while they ``rewrite the rules of international finance.'' ``The idea of suspending the markets for the time it takes to rewrite the rules is being discussed,'' Berlusconi said today after a Cabinet meeting in Naples, Italy. A solution to the financial crisis ``can't just be for one country, or even just for Europe, but global.'' I am telling you that this man is doing the very things that the bible says the Antichrist does. This is why I want you to keep paying attention to what he does. He could be the man Jesus warned us about. Jesus warned us that the Antichrist would go after 3 kings when he came into power. Another reason why I have been watching Berlusconi is because he has a thing over 3 nations. This is what I have written in my book. "What about the three kings, leaders of three nations that the Antichrist will subdue when he arises? We may have a clue who these three nations will be. For example, when Silvio Berlusconi, the former President of Italy, was in office he kept going up against the same three leaders who were seeking to be the strongest EU nations. Here is one example how France, Germany, and the UK have been labeled the “gang of three” in the press. The Independent.co.uk report had headlines that read as follows. Berlusconi launches attack on ‘gang of three’ alliance,” and they stated, “A fierce backlash against a new alliance between the UK, France and Germany surfaced yesterday ahead of today’s three-way summit between the British, French and German leaders in Berlin. On the eve of the gathering, Silvio Berlusconi, the Italian Prime Minister, declared his fervent opposition to any move by Europe’s big three nation to join forces” (Feb. 2004). As of June 5, 2012 these same gang of three nations are still looked at as the strongest three nations in the EU. Is it a coincidence Daniel pointed to three kings or, if you will, leaders of three nations, and now the revived Western leg of the old Roman Empire has given the label to Germany, France and, the UK as the gang of three? I also found it interest that these same three nations will still be part of the ten nations that is taking over the WEU job. Now that the WEU will be handing over their job to the ten nations of the European Union Satellite Centre we need to watch what they do. It only stands to reason that if these three nations are the strongest of the ten that it would be these three leaders the Antichrist will go after." hawk. Keep in mind he is a very close friend of Israel! Fact is, when Berlusconi was President he even asked to move the peace talks to Italy at one point which really made me pay attention. 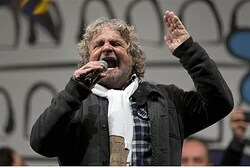 He is the latest news on the Italian elections. Are you really searching to know the truth? All the facts you need to know showing the Bible is true and we are seeing Bible prophecy being fulfilled can be seen today by downloading my prophecy book for free today! To receive my prophecy up-dates for free you will need to go to my other prophecy site and subscribe to get my daily up-dates. Please go to www.endtimesresearchministry.com . I am back from my trip to Costa Rica. Jesus blessed me by placing people for me to witness every where I went. Here is Friday's up-date if you missed it. Before you read this first report which you see the headline in green I want you all to know I have someone who is in the Gaza right now. This is what he wrote me today and I wanted to pass this on to you. Hi Frank, I am sitting in Israel and near Gaza and this report by the Iranians is not true. Because I am still in the jungle in Costa Rica I am unable to give you a commentary on each news report. For those of you who live in the Atlanta Ga. area I will be speaking there April 20, 2013. I will provide all the details when I get back to America. Please pray for me as I continue to see doors open to preach Jesus here in Costa Rica. I also need prayer as my book has taken off in Africa again and many desire to get a copy so I will need our Lord to provide as I never charge anyone to get my book or the Bibles I send.